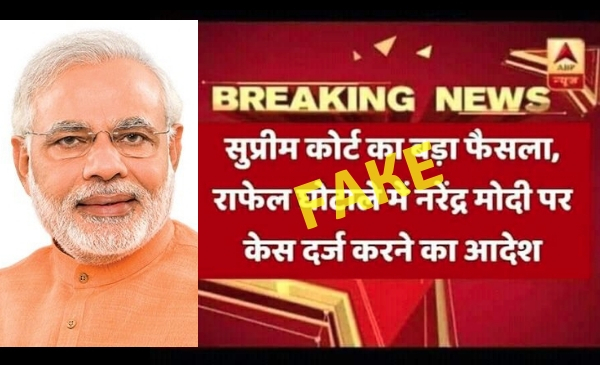 A fake graphic attributed to Hindi news channel ABP News has gone viral on social media claiming the Supreme Court has passed an order asking for a case to be filed against Prime Minister Narendra Modi in the Rafale case. The Supreme Court has passed no such order nor has ABP News reported this. Click here to read more. 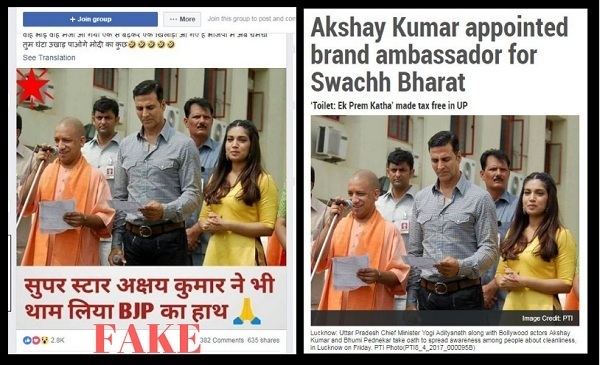 A 2017 photo showing actors Akshay Kumar and Bhumi Pednekar along with Uttar Pradesh Chief Minister Yogi Adityanath at a public event is viral on Facebook with false context that Kumar has joined the Bharatiya Janata Party. However, the actor has made no such announcement. Click here to read more. 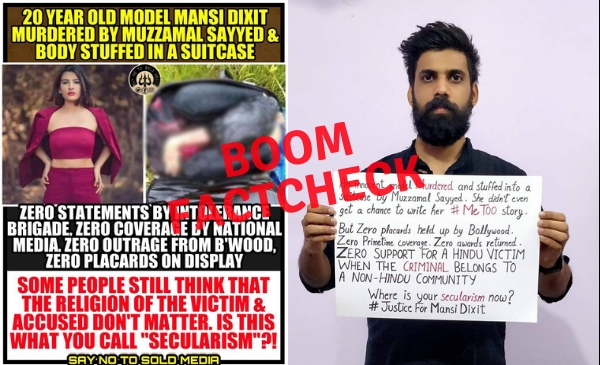 A gruesome image of a body stuffed in a suitcase is being wrongly shared with a communal angle as that of model Mansi Dixit who was murdered recently in Mumbai. However, BOOM’s fact check revealed that the image is not connected to Dixit’s case, but a murder that happened in August 2017 in Navi Mumbai. Several Facebook pages have shared the post. Read the details about the case here. 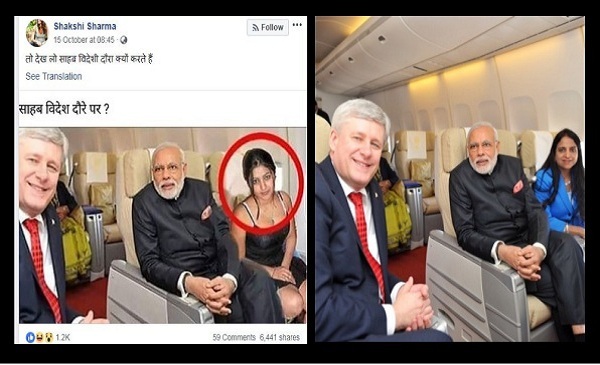 An image showing Prime Minister Naredra Modi sitting beside an unidentified woman on board an aircraft, is fake. The morphed image shows a woman in a black dress sitting beside Modi with former Canadian Prime Minister Stephen Harper also in the frame. The original photo shows Gurdeep Singh Chawla, US-based interpreter and translator who is a common face during Modi’s overseas visits. Click here to read the full story. 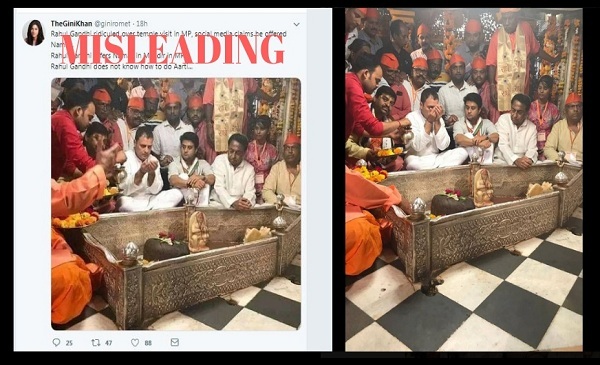 A photo of Rahul Gandhi along with senior Congress leaders Jyotirao Scindia and Kamal Nath at the Achaleshwar Shiv Mandir in Gwalior has gone viral on Facebook with a misleading context. The photo claims to show Gandhi with folded hands, alleging him of offering Namaaz at a Hindu temple while on the campaign trail in Madhya Pradesh. The original photo is a still from Rahul Gandhi performing various rituals at the temple along with this party colleagues. Click here to read more. An image of Congress leader and Chhindwara parliamentarian Kamal Nath at an awards ceremony gained quite some traction on October 14, 2018.The text with it claimed, “Proud moment for Madhya Pradesh’. 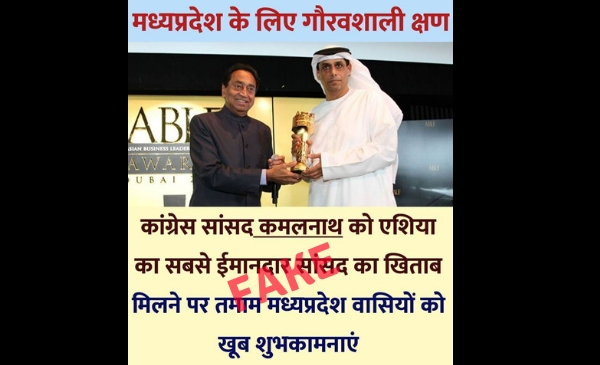 Congratulations to the people of Madhya Pradesh as Congress leader Kamal Nath was awarded ‘Asia’s Most Honest Parliamentarian.” The image dates back to December, 2013 and is actually a photo of Kamal Nath presenting an award at the Asian Business Leadership Forum in Dubai. Click here to read more about the image. 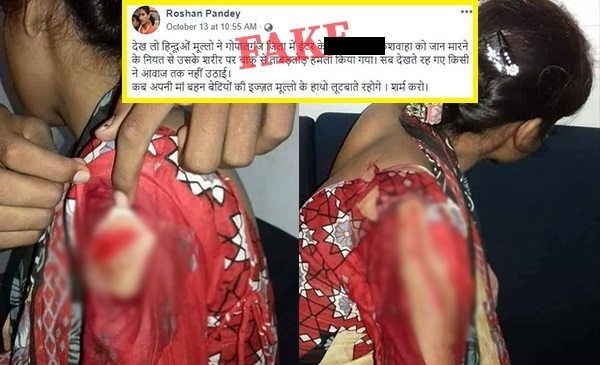 A series of photos showing deep gashes on the body of a young woman from Bihar is viral on social media with a false narrative that the woman was attacked by Muslims. The images are from an incident in Gopalganj district in Bihar when a 20-year-old woman was attacked by one Sandeep Giri while she was on her way to a temple. Click here to read more. 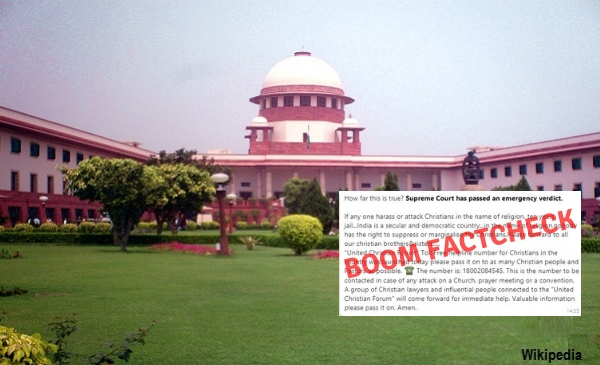 A message claiming Supreme Court has passed an emergency verdict to give 10 years jail for those guilty of attack on Christians is fake. 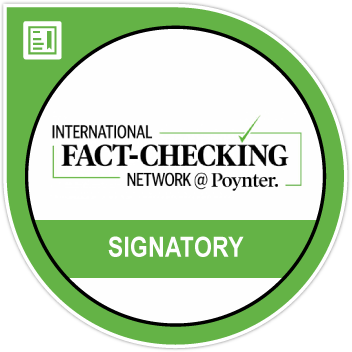 The message is being widely shared along with a toll free number 18002084545 of the United Christian Forum for Human Rights (UCF), an inter-denominational Christian organization. However, the spokesperson of UCF has clarified to BOOM that this message is not from the organisation and that the Supreme court verdict mentioned in the message is false. Read more here. 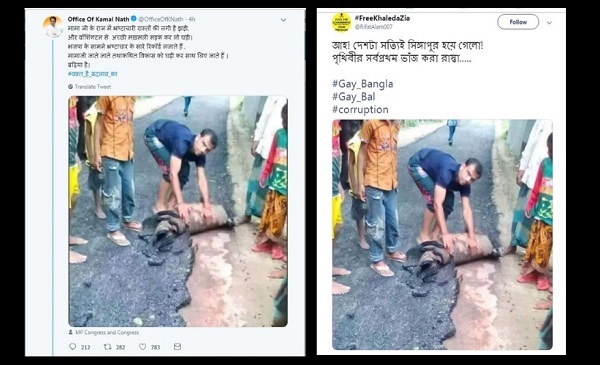 The official Twitter handle of former union minister and senior Madhya Pradesh Congress leader Kamal Nath tweeted a photo of a poorly constructed tar road, that is seen being rolled up like a carpet, blaming it on corruption within the Bharatiya Janata Party (BJP) government in the state. The photo, however, is not from India. Read more about it here.